Bullion investors know governments are fickle and sometimes change the rules to suit their whims. They know the U.S. government has piled up more debt and obligations than it can hope to meet, and they can pretty much guess the ramifications. Fiat currencies die – often spectacularly. That’s why lots of proponents of holding physical bullion insist that you must take possession of the metal you buy. “If you can’t hold it, you don’t own it,” they say. It’s pretty darn good advice. The simple truth is that if your metal is not under your direct control and you have to rely on some third party, you are definitely assuming some risk. However, there are at least a couple of scenarios when outsourcing the storage of your metals is a good idea. The first scenario involves physical security of the metal. Some investors live where they are at higher risk of burglary. Perhaps they live in a tough neighborhood. Or maybe someone in the family is battling drug addiction and acting desperately. 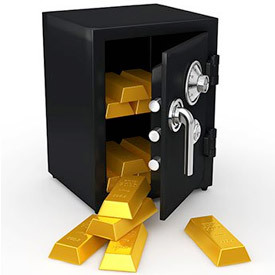 Sometimes the need for physical security may trump all other considerations, and the investor will choose to store some or all of his metals in a depository that offers a UL-rated Class 3 vault and 24-hour monitoring. Investors with large holdings may also decide that putting all their bullion in a single location represents too much concentration of risk. The choice to utilize depositories might make better sense than stuffing the basement safe with a life savings’ worth of metal. The second scenario involves IRAs. Millions of Americans hold conventional assets in their retirement accounts. They have financial advisors telling them about the merits of diversification, but guiding them into 100% paper investments. Their fortunes are completely tied to the modern financial system and Wall Street. IRS rules require the assets in retirement accounts be held by a third party, but that does not mean investors are stuck with paper. They can buy physical gold and silver. Then arrange for segregated storage via a self-directed IRA. It is hard to beat the privacy and control that comes from taking personal possession of physical bullion. We recommend everyone do that with at least a portion of what they own. However, our experience has taught us there are very good reasons to utilize depository storage as well. That is why we launched Money Metals Depository several years ago. If you need storage for any portion of your metals stockpile, we will be ready to help – just call us at 1-800-800-1865.